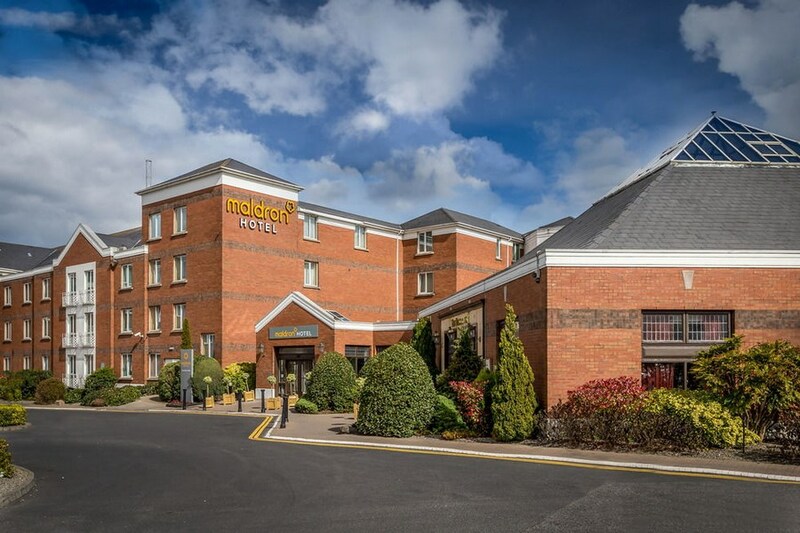 The Maldron Hotel Newlands Cross is situated just off the N7, Dublin city's main artery to the south of the country, in west County Dublin's industrial and business district, it is also close to the M50 Junction 9. 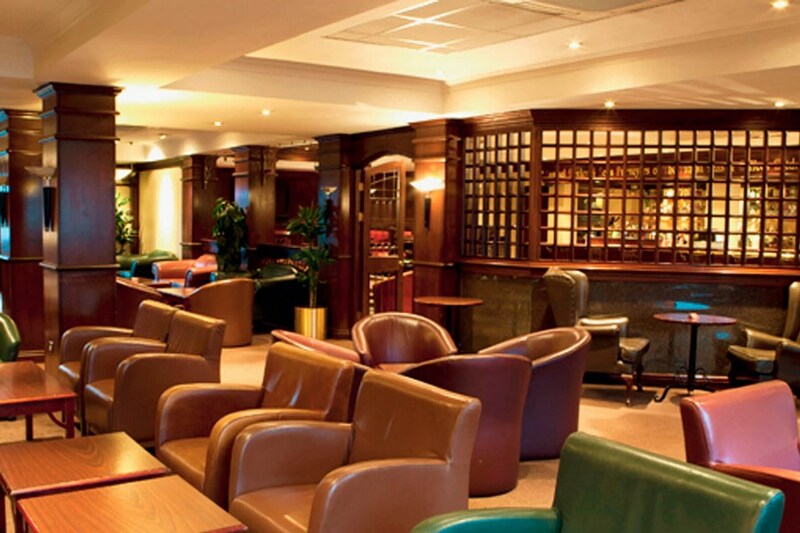 This hotel is ideally located for Citywest Business Park and Citywest conference Centre. 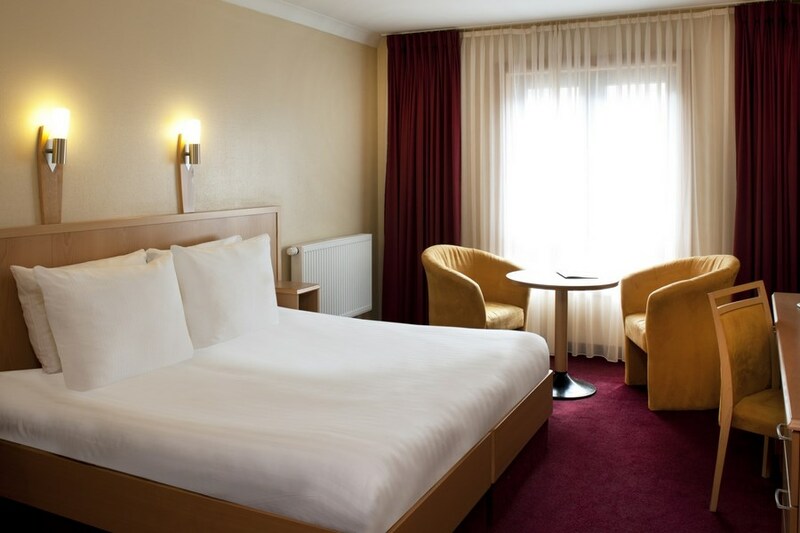 The hotel is located at Newlands Cross just of the M7, and take junction 9 south of the M50 motorway. Modern decor, very clean, parking lot is fairly packed but great value for a family break. Ideally located with an Aldi across road, takeaway options across the road too. This is a busy hotel. Check in was busy but efficient and we were checked in by a nice male receptionist. The room was lovely comfortable,bright and airy with two double beds. The only disappointment was the room service food we were looking forward to having. We ordered two Asian noodle dishes at €17.00 each and a portion of fries at €4.50. The room service arrived on a tiny tray with 2 small Chinese cartons which looked like they ran across the street to the local Chinese restaurant and picked them up! The chips were on a carboard container like you would find at Supermacs. Very disappointed, I expected at least a plate to eat from at the prices charged, the fries were crispy, dry and overcooked. All in all not worth what we paid plus the €5 delivery charge on top. When I mentioned it to the waiter that I was expecting plates, he said that's how it comes and made no offer to bring plates, he was only interested in collecting the cash for the food. All the breakfast staff we encountered were lovely and the breakfast was of a good standard in a nice restaurant setting. We stayed for just one night after Christmas. From the moment we stepped into the hotel until the moment we left everything was perfect. Staff was friendly, hotel was warm and clean. Our family room was warm, clean, spacious and most importantly with kids, so quiet. Staff at breakfast was very friendly. There was ample variety of food and tasted fantastic too! All in all we would highly recommend and will definitely be returning. Stayed on Saturday 19th November and to be honest we were glad it was only for 1 night. Hotel would need a facelift or freshened up. Our room smelt musty and the bed was very uncomfortable so much so we did not sleep. On a positive note the breakfast was extremely good. Would We return - sorry no. Although the beds were comfortable I was disappointed with the reception staff at check in. We arrived late at midnight from our flight and had confirm this with the hotel prior to arrival. The staff on reception were not friendly or helpful. The carpark was full and we needed parking and the reception staff took no interest in assisting us. We also requested two adjacent rooms, these were on different floors which made it difficult.for us. The breakfast was average and the 'fry' was very greasy. We've stayed at this hotel on a number of occasions over the years and will be considering alternatives for the future. Hi, Stayed for two nights B & B + 4 dinners recently. The all-in price was very reasonable by other hotel charges and the rooms were also very comfortable. The Hotel seems to cater for a very mixed group of travellers with a lot of Budget type guest activity happening during our stay. All-in-all good value for money - the breakfast was excellent - the dinners on the other hand only reasonable. My friend and I stayed in the Maldron on Sun 21st Aug as we were playing golf in Beech Park Golf Club on Monday morning. What a pleasant stay we had. We were greeted by a kind, courteous, pleasant gentleman named Artur. We ate in the restaurant on Sunday evening and received a fabulous meal, served by kind friendly staff. Our room was spacious, bright and spotlessly clean and had two beautiful comfortable beds. Breakfast next morning was superb with everything one could ask for. We certainly hope to stay here again and had no complaints whatsoever. Siobhan & Mary (Galway). Lovely rooms very spacious. Lovely food friendly and helpful staff. I have nothing but good things to say about this hotel! Friendly staff at check-in, restaurant and bar. I especially liked the free parking and free RSVP magazine in our room along with breakfast available until midday. Had dinner on the night of our stay which was rather enjoyable despite having read some previous negative reviews. Very attentive staff and relaxed environment. The hotel is beautifully decorated for Christmas with each table in the restaurant having it's own centrepiece. Got a peaceful night's sleep and stayed here as went to see Kodaline in the 3Arena. Was a 15min walk to the Red Line Luas which I did not mind as it was not raining! Got a taxi on the way home from Red Cow stop back to the hotel which cost €8. My only negative comment was being charged €2 for a bag of Keogh crisps in the bar!! !.......I thought it was a bit steep but I would definitely stay here again as handy to slip onto the M50 in the morning. Enjoyable overnight stay. I enjoyed my stay l would give it 5 star for all the staff , they were very friendly and helpful both at the reception and dining room. Stayed here for two nights Dec 4th & 5th. Room was clean and cozy. The staff were very friendly and professional. We had dinner in the restaurant on the sat night to celebrate a birthday, there was 10 of us and the staff couldn't have been nicer. The food was delicious. I would definitely stay here again. Also Its also only a 20 min walk to the lusas. The bed room was fine with no complaints! The evening dinner was terrible, my steak was appalling my friends salmon meal was poor too. We were charged for teas and coffee when our package had them included in the price. The restaurant was freezing cold. Given that our evening meal had been so poor (the poorest by far in memory and I am 46 years old) I would say the breakfast was surprisingly very tasty!! If I had not had the dinner I would be very happy with this hotel. It would not necessarily put me of staying again but I certainly would not have the evening meal. Fantastic stay. Staff were fantastic. we stayed for one night and found the staff extremely helpful and friendly. The breakfast was buffet and of very high quality. However the Hotel itself is looking tired and need of a revamp. when we arrived in our room the xtra bed was broken and we had to call maintenance. The staff were very friendly and helpful with this and also in the restaurant where we had lovely food . However the hotel is in need of refurbishment, a lot of the seats in the bar were broken and there was s horrendous smell of sewerage, there was a stale smell in the bedroom aswell!! Room nice and clean Bed very comfortable. Lovely selection for breakfast Generally very good all round Price reasonable. Would book again Many thanks. Geraldine. We really enjoyed our stay. Breakfast and dinner was just wonderful. The rooms were very comfortable and the value for money was just great. There was a great atmosphere in the bar that night too and we wouldn't think twice about going back there again for a longer stay. Geographically speaking it's great for going all around Dublin. Because we have children the only thing that's missing is a pool but then again I think it gears itself for the more short term stay for which it could not be better. The last 2 times we have stayed in Dubln it has been here. Why? The staff are excellent, rooms are comfortable and well presented. The breakfast is top class. Everything is fresh, well cooked and quality food. Overall this was another pleasant stay and we will be returning again. room was very clean, and the bed was very comfy.could not fault the room,but the food was very poor. the portions were small, the potatoes were cold and the steak that i paid 5e extra for was due to be medium but im afraid you could use it as shoe leather.the road works outside the hotel are very off putting .fine for a budget stay but not for a luxury stay away. Grand hotel, stayed here before and new what we were expecting, excellent staff and breakfast, first room was cold and we were given a new warm room. Great family hotel, rooms were spacious, food was great and the staff were excellent. I would defiantly recommend this hotel. Recently stayed in the Bewleys Newlands Cross. Very satisfied. The staff was very helpful and friendly, rooms spacious and comfortable. We had the deal with 2 course dinner and breakfast included in the price. The food was excellent !. Will definitely recommend the hotel to anyone.